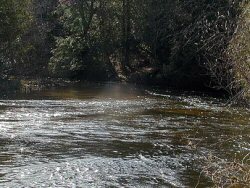 The Betsie River is located in Grand Traverse, Benzie and Manistee counties. The stream originates at Green Lake near the village of Interlochen and flows in a westerly direction to its outlet into Betsie Lake and Lake Michigan near Elberta and Frankfort. A large part of the river lies within the boundaries of the Fife Lake and Betsie River State Forests and flows through the Betsie River State Game Area near its mouth. The Betsie River drains a surface area of approximately 165,800 acres and includes about 93 linear miles of streams, 52 miles of which is mainstream.